Today’s Blogging Help post is for those of you who aren’t yet bloggers, but have been toying with the idea of starting a blog. In the last couple of weeks, I’ve had several people contact me saying that they’ve been inspired to start a blog, and they want to do it right from the start, i.e., bypass Blogger and go right to a self-hosted WordPress blog (a decision I sooooo wish I had made five years ago when I first started blogging). If you’re considering starting your own blog, and would like to bypass the whole Blogger thing and go right to WordPress, I’ll show you step-by-step exactly what you need to do to set up your own self-hosted WordPress blog. First, let me answer the question that I know many of you already have. What exactly is a self-hosted WordPress blog? Self-hosted simply means that you pay a website hosting company to store all of your website files on their servers. You have your own domain name (e.g., addicted2decorating.com), you own all of your content, and you have complete control over your own site. You simply rent space on their servers to store the content and to make that content available for people who visit your site. How is that different from Blogger? A self-hosted WordPress blog is completely different from a Blogger blog or even a WordPress.com blog. Both Blogger and WordPress.com allow you to set up a blog for free. Both of those act as the host for your blog. Blogger uses their own proprietary blogging software that is unique to Blogger.com, and WordPress.com uses the WordPress software for blogging (although with major limitations regarding customization). However (and this is key), when you blog on one of those free blogging services, you don’t truly own your own content, and you don’t have absolute control over your own content. Your content is essentially owned by Google (on Blogger) or Automattic (on WordPress.com). You must abide by their terms of service, and if they feel like you haven’t done so, they can take down your blog without warning. I know it sounds like a stretch, but I’ve read stories from several bloggers who put countless hours into their blogs, only to wake up one morning and not be able to find their blog. It was gone. Vanished. WordPress.com also has very strict rules regarding advertising…as in, they don’t allow most advertising, making the most basic money-making options (e.g., Google Adsense) unavailable to people who blog using their free blogging service. How much does a self-hosted WordPress blog cost? The good news is that while a self-hosted WordPress blog does cost money, it’s not expensive at all. The costs include the purchase of a domain name ($10 to $15 per year), and a hosting account (under $10 per month for a new blog). How to start your own self-hosted WordPress blog. Before you can have a self-hosted WordPress blog, you must first find a host. 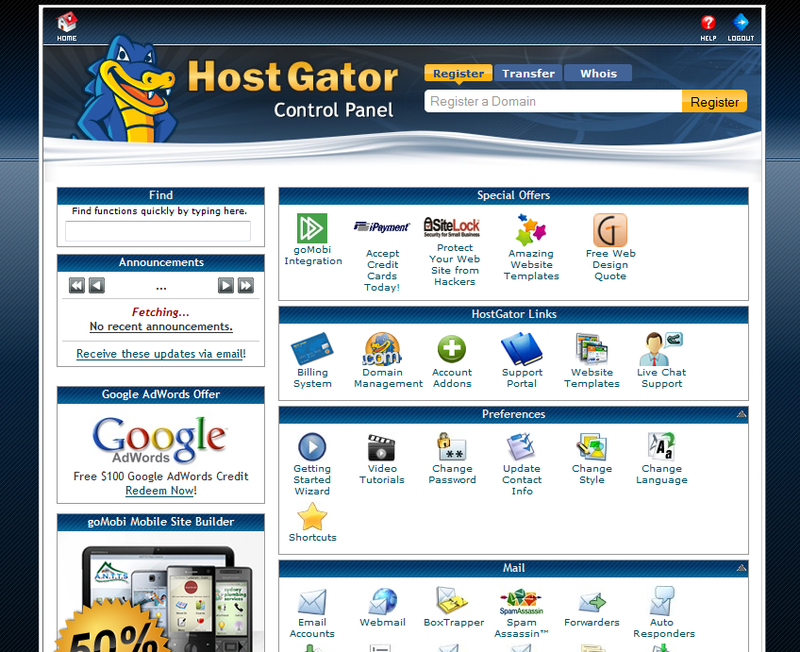 I personally use and recommend HostGator*. They have fantastic customer service that is available 24/7/365, and their customer service reps are very knowledgeable. They host all four of my own websites. First, click this link to get to the HostGator home page. In the middle of the home page, you’ll see a big orange button that says “View Web Hosting Plans”. Click that button. On the next page, you’ll see three different plans. Since you’re starting a brand new blog, the Hatchling Plan is all you need. Click the dropdown menu to choose how you want to pay (month-to-month, six months at a time, one year at a time, etc. ), and then click the Order Now button. On the next page, you’ll enter the domain name that you want to use for your blog. Choose carefully!! If the name you choose has already been taken, you’ll receive a message stating that it’s not available. Just try another one until you find one that you like, and that is still available. I personally suggest using the .com if it’s available. Once you’ve selected your domain name, click the “Continue to Step 2” button. IMPORTANT: If you choose a domain name, and the .com is not available, be very cautious about choosing the .org or .net version of that name UNTIL you’ve checked with the U.S. Trademark office to ensure that the name hasn’t been trademarked. You don’t want a legal hassle on your hands right out of the starting block! In fact, I’d recommend checking with the U.S. Trademark office before choosing ANY domain name. You can check their records online here. Under “Tools” click the first option that says “TESS search trademarks”. On the next page, fill out your contact and billing information, and then click the “Create Account” button. Now that you have website hosting, you need to install the WordPress blogging software, and HostGator has made this very simple for you. Scroll down on the Control Panel screen until you find the section that says “Software/Services”. Click on the “Quick Install” link. On the next page, you’ll see an entire list of software that can be installed on your new website hosting account. 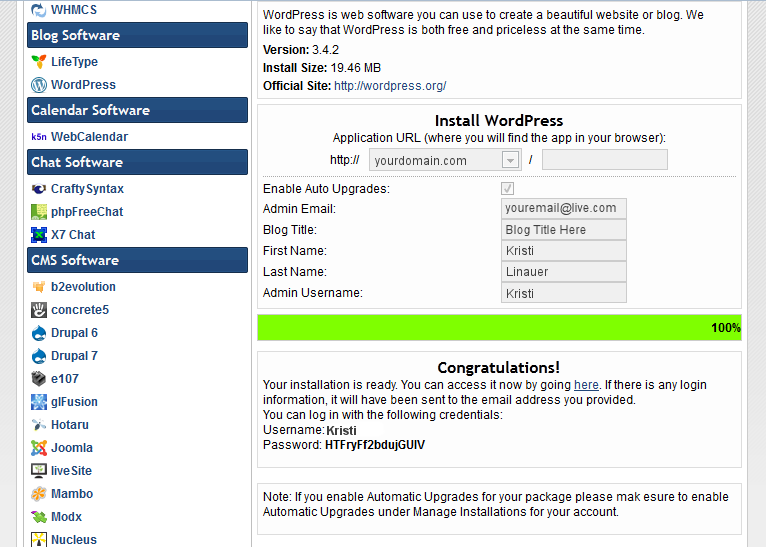 Look for “WordPress” under “Blog Software” and click the link. It’ll bring up information about WordPress (version number, file size, etc.). Click the “Continue” button. It will bring up several fields that you need to fill out. The domain name will fill in automatically, so leave it as it is. Fill out the admin email, blog title, your first name and last name, and the admin username that you want to use as your WordPress login name. When you click the Install button, it only takes about a minute (or less) to install, and then you’ll see a “Congratulations” message at the bottom with a link to your new WordPress blog, your username, and password. Click the link to your blog, and you’ll see…well…a blog! It installs with the default Twenty Ten WordPress theme. 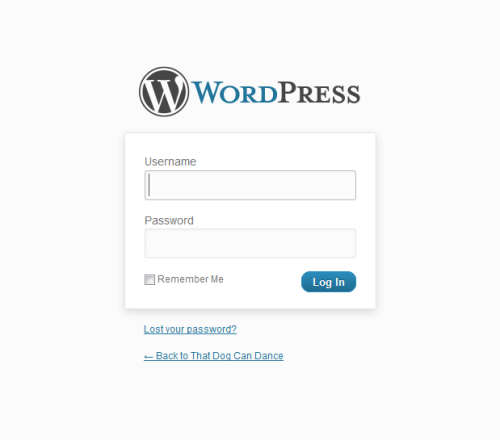 After you log in, you’ll see your WordPress dashboard! The main menu for all of the different areas of your dashboard is in the left column. The welcome message in the main part of the screen displays the first time you log in, and contains lots of helpful links at the bottom that will help you get started with learning WordPress. If you don’t want to see this welcome page anymore, simply click “Dismiss” in the upper right corner of the welcome message. I recommend that the very first thing you do, before exploring your dashboard, is change your WordPress password to something other than the automatically generated password. In other words, change it to something that you’ll actually remember. 🙂 Do this by going to Users –> Your Profile on the left main menu. Scroll towards the bottom, and you’ll see an area where you can enter a new password. After you do this, click the “Update Profile” button. 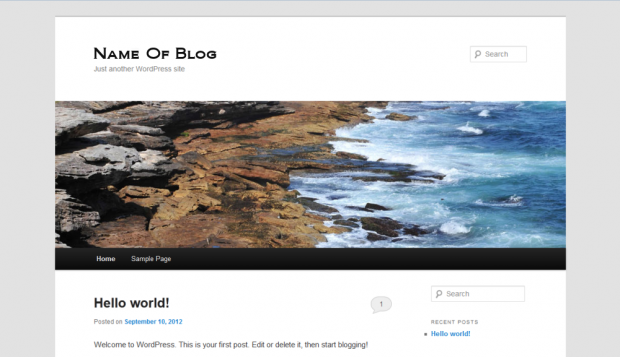 And now you’re ready to explore your dashboard and familiarize yourself with your new WordPress blog! Everything you need can be found right there on your left main menu. *If you read through this tutorial and think it looks too complicated, or you just don’t want to do it on your own, I do offer this service completely free of charge. You can read more about it here.) This post contains affiliate links. 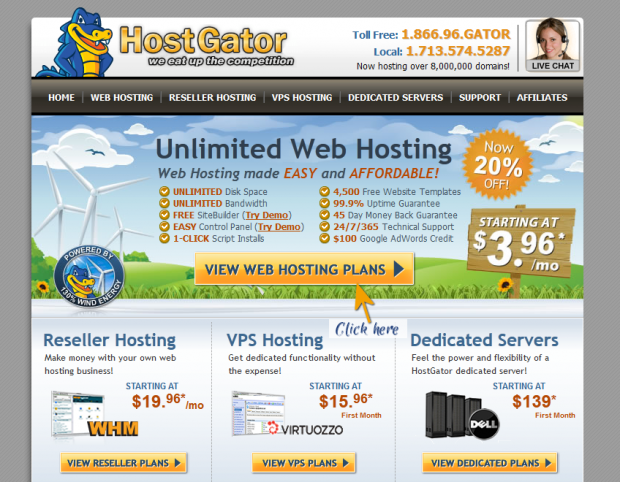 If you sign up for hosting through my affiliate link, HostGator pays me a commission. Think of it this way…you’re helping me save up for that downpayment on a house! 😀 So…THANKS!! Previous Post Who Do You Truly Design & Decorate Your Home For? I have been looking into self hosting for a while, thanks so much for the tutorial!! Good stuff!! You do make it look pretty easy. And really it wasn’t too bad for me to get one started….I just needed you to take it from the foundation…which you did a great job with…thank you very much!!!! Thank you so much Kristi! I am one of those toying with the idea of my own blog. If I ever settled on a name that wasn’t taken, I’d be golden! 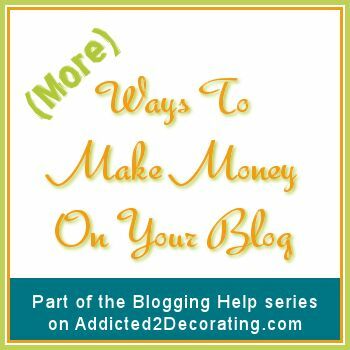 But, this is a great resource to get me started (along with your other blogging information posts). I’ll let you know if I ever start one! Great stuff Kristi. Thanks so much for posting about this subject. I’ve been looking into having a self-hosting blog and this article is great. I’m going to come back later and study it a little more. Thanks so much for your openness about blogging. 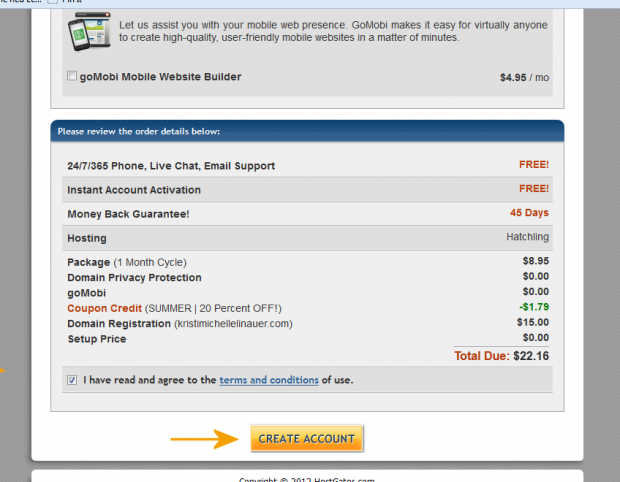 Any advice on how to transition an already free wordpress blog to host gator? I just started my blog at the beginning of September. And I started with the free but now I am ready to move over to the hosted. The host gator package is exactly what I need. I am just wondering what I need to do to incorporate my WordPress blog and secure my domain. You would need to follow the steps above just as outlined. Once you have your new WordPress blog set up, you should be able to go to your WordPress.com blog and under “Tools” there’s an “Export” option. That saves your blog info to your computer. 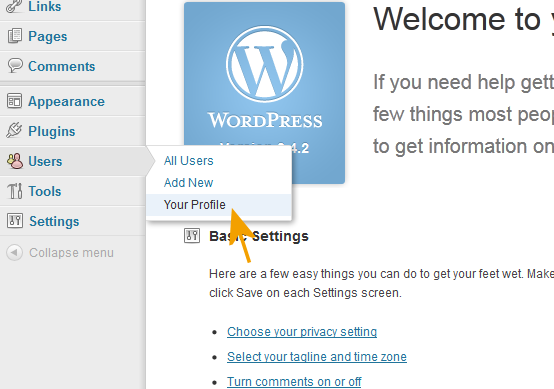 Then on the new blog, you use the “Import” option, and select “WordPress”. Then it will prompt you to upload the information from your computer. Thank you so much for posting this. I sure wish I was blogging when I first bought my house – oh the projects we did. Anyway, I want to start blogging in hopes of future projects and maybe I’ll just have to feature other great project from other great bloggers for now. Thanks again..
Hi Kristy, I have the same question as Kimberley. I just purchased a domain name and mapping from WordPress.com prior to knowing the difference between the two. I’d like to transfer to a self hosted WordPress.org blog and keep my registered domain name. Do you know how I can do that? I dont have any content to transfer over. I appreciate any info you can provide. Oh boy- this would have been so handy just about 10 days ago. I just did this only I ended up hiring someone to do most of the nitty gritty for me. While I know I could have handled this part- transferring everything over from my old domain was something well worth the $120 to pay someone else to do for me. Overall- I am so happy I made the switch. That is for sure. You’ve totally inspired me to begin the process of switching over to self-hosted WordPress. Thanks for the tutorial! 1. If I already own my domain name (freckledlaundry.com) and my blogger blog is currently live on that domain, would I just purchase a temporary domain name (i.e. freckledlaundry2.com?) while I design, etc. until I’m ready to migrate? 2. What theme do you recommend most? 3. Is there a way to build my design behind the scenes without having to go through the hosting step first? Thank you so much for the above WordPress set-up tutorial. I followed your instructions and now have a blog – something I’ve been wanting to do for at least a year. Yay! I am completely new to blogging and I’d like to play around with my blog before I “go live”. The problem is that it appears that I already am live. Is there a way for me to work on the blog theme & pages behind the scenes so that I can launch the blog with posts already done and the layout in a finished state? Any help you can give me would be greatly appreciated! That’s actually a great question, Ann. I’m really not sure! There should be a way, but I’ve never done it before. My suggest would be to call your host’s customer service and have them explain the process. I think it would need to be done through your Hostgator (or other host) Control Panel, and not through your WordPress blog dashboard. Thanks for your response, Kristi. I’ve just found a wordpress.org support page with instructions for “test driving” wordpress. Here’s the link: http://codex.wordpress.org/Test_Driving_WordPress. I’m in a different time zone than you and have stayed up too late already…it all looks Greek to me! Hopefully with a good nights sleep and a cup or two of coffee I’ll be able to figure it out tomorrow! I just wanted to thank you for all your blogging help posts. Thanks to you, I have my site up and running and I\ve been having a blast with it! This post in particular was just the push I needed to get started. Thanks again! I just reviewed you step. I have another tip for you. You can find a fellow blogger or website owner who you can ask to share hosting. 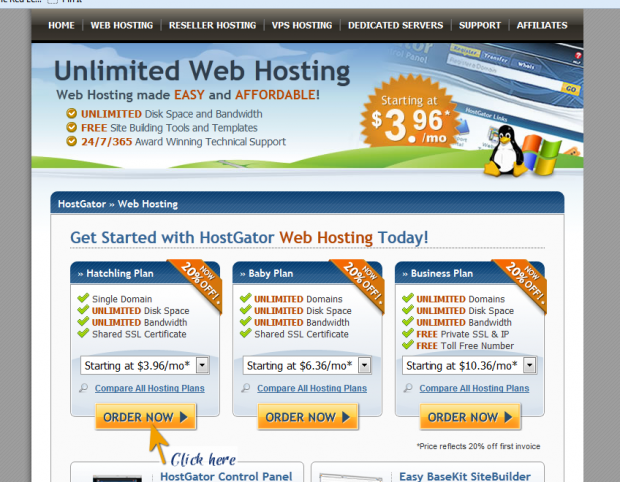 There are cheap web hosting that you can add unlimited domains. 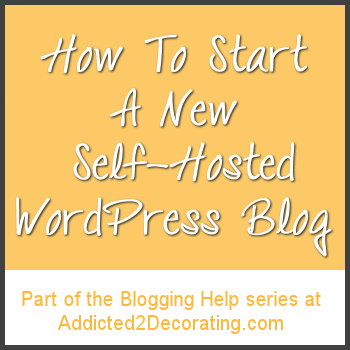 How to Start a New Self-Hosted Wordpress Blog | So You Wanna Be a Blogger? I’m on Host Gator’s website as we speak (on a link from your page) and I’m trying to buy my domain name. I’m in the checkout process and it keeps asking for a pin number in the create account section. I don’t have a pin. It won’t let me progress any further. Any idea what I’m doing wrong? 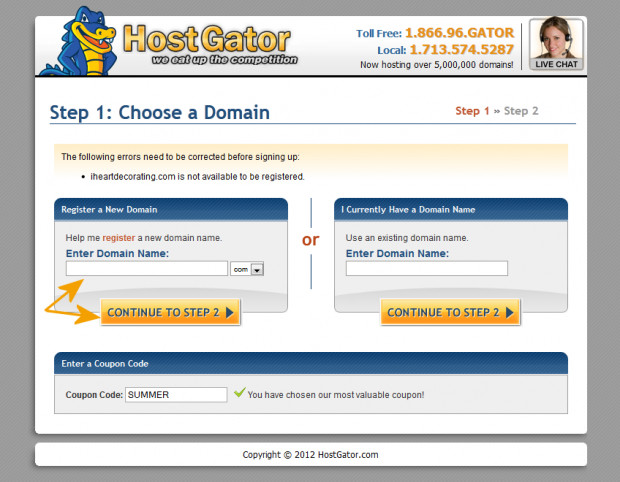 I’m still trying to sign up for Host Gator through you and I’m still having trouble. This time it’s telling me that my username and pin number are incorrect but they meet all the criteria. I don’t know what I’m doing wrong. Maybe I’ll just try it again tomorrow. This is the 2nd time I’ve tried to sign up and not been able to. I hope you can help. I remember reading this on your site (maybe somewhere in your comments), but now I can’t find it. Do you use the Genesis Framework? Also, do you use a Child Theme? If so, which one do you prefer? I’m in the stages of putting this “blog thing” together, and I’m researching what would be my best options. Thanks so much for sharing all of this wonderful information! Hi Kristi, I know that I need to be backing up my wordpress site and database, but I have tried some plugins that won’t allow me to do so. I keep getting error messages. I am new at this and feel like I am walking in the dark here. Can you recommend a good and easy way for dummies like me to backup my site? Thank you for any info!